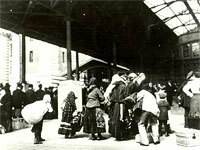 Ellis Island in New York - Immigration station 1892-1924 in the New York harbour. 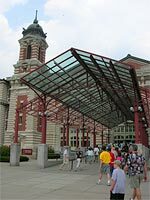 To take a trip to Ellis Island is an interesting experience both for you that are performing genealogy but also for you that are visiting New York just for the city itself. Ellis Island is an Island that are situated in the harbour of New York in the opening of Hudson River. The Island was used as an immigration station from 1892 to the mid 1900´s. According to the statistics during the period 1892-1924 approx. 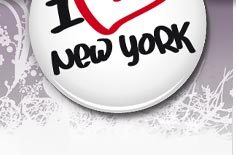 20 million immigrants came to the US and nearly 71% (14.2 million) arrived at New York. Over one million were Swedish emigrants. At the Island you can view a lot of history. If you know that some of your relatives have emigrated to the US this is a very interesting place to go to. You can take the ferry from Battery Park. Read more about Ellis Island and how it was for the emigrants to arrive to New York and how you most flexible can take you there - more information! Boat ticket to the Statue of Liberty and Ellis Island (appr 3 hours). With this ticket you go on your own out to the Statue of Liberty and Ellis Island. 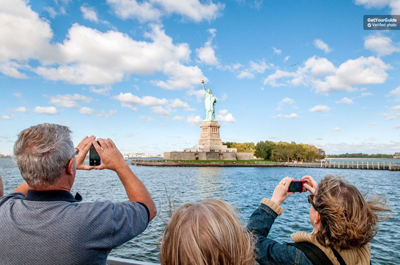 Walk around on Liberty Island and view the Statue of Liberty in all different angles and get a fabulous view towards Manhattan. You decide if you also hop off at Ellis Island. If you have not been there before, do not miss to go around in this amazing museum of all the immigrants who arrived to New York via the island during the 1800s and early 1900s. There are several boat back to Manhattan. The museum is located in the main buildning. Here you can view the buildning and the exhibition over Ellis Island history with focus on all the immigrants that passed through here. The exhibition shows clearly how it was to arrive here and undergo all stations with controls with stories from those who worked here and from immigrants and also pictures, clothes, bags, documents etc. See the amazing movie of Ellis Island. History has made its mark in the buildings where millions of people crossed in search of happiness in the promised land America. 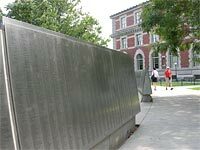 Outside the main building you will find the Wall of Honour - a long wall with engraved names, over 600.000 persons. This is a wall from relatives to pay tribute to the immigrants. It is located beautiful with both a view of the Statue of Liberty and the Manhattan skyline.